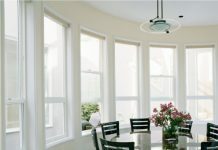 In case you are going to install replacement windows at your home, here are a few steps, which you should consider carefully, in order to install the windows without damage. The first and the most important thing is to measure the old window frame. Make sure you are measuring the frame’s height from the top of the sill to the underside of the head jamb. Record the smallest measurements, for they will guide you to what window to choose. Use an angle-measuring tool to measure the slop of the still. Remove the old sash from the window frame as you pry off the wooden stops, in order to remove the sash. Be careful for prying off the jam liners. The best thing you can do is to use flat bar, for you will pry them free. Prep the frame as you remove all the loose and blistered paint. Scrape them off and sand the jambs. Then you can paint the surfaces. In case this is the first window replacement you are doing, then you need to remove the original sash weights from their pockets. After that, simply insulate the frame with insulation foam. Spray it into the holes and into the sash-weight pockets. Leave the foam for 6 hours and then continue with the work. The very next step is to caulk the openings. Use an elastomeric caulk and apply it to the blind stops on the top of the frame. Two continuous beads of caulk also should be considered, but along the windowsill. The installation of the window is from inside of the room as the bottom of the replacement should be placed onto the sill. Press the window against the exterior casings and push tight. Fasten it loosely as you close and lock the sash. The next thing to do is to shim the window. Measure the window diagonally and screw it through the predrilled holes. The shim is necessary, in order to avoid bowing of the frame. Slip a shim behind the jamb at each screw, and then simply trim the shims flush with a knife. The last things to do are to prime, paint and caulk the window. Finish the installment by reinstalling the stops. It is recommendable to add new ones. If you can’t prime and paint the window, just stain the window’s sash and frame’s interior.